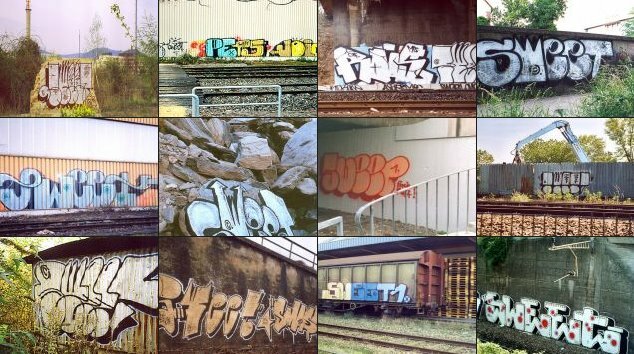 If It's Hip, It's Here (Archives): Tag, You're It! Graffiti Is Appearing Everywhere And On Everything. Tag, You're It! Graffiti Is Appearing Everywhere And On Everything. Graffiti: Etymology: Italian, plural of graffito [scribbling; graffito, a scratch]: usually unauthorized writing or drawing on a public surface. 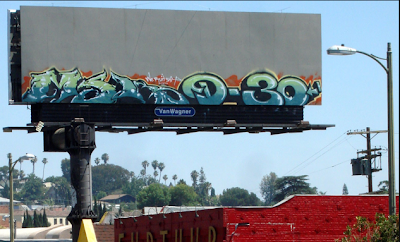 Graffiti, once synonymous with vandalism, reached an art form several decades ago. It was way back in 1972 that Hugo Martinez founded the UGA- United Graffiti Artists. 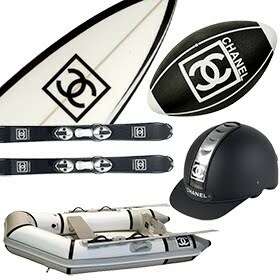 It didn't take long to permeate the skater and surfer scene, where it lay for a long time. But in recent years it's crept from edgy to mainstream. As an art form, Graffiti has reached such a level of status that it is frequently referred to as 'street art' or 'urban art' as opposed to vandalism, tagging and graffiti. 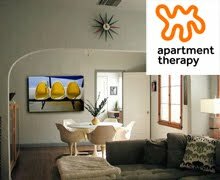 And many artists have traded in walls for canvases. Even selling prints and gicleés on ebay and in surf and skateboard shops. Right now, street artist Banksy is setting the art world afire fetching prices on par with paintings by Renaissance masters. 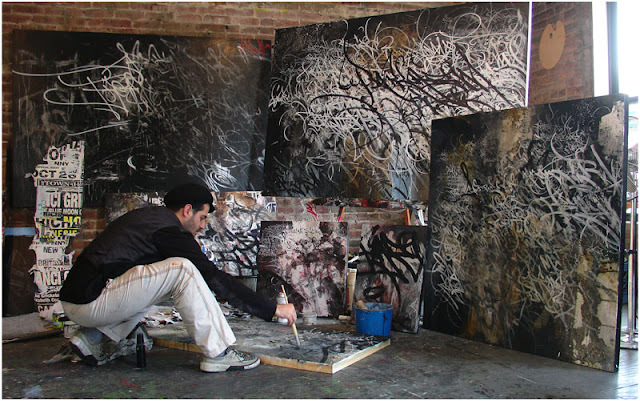 Above: Artist José Parla at work. 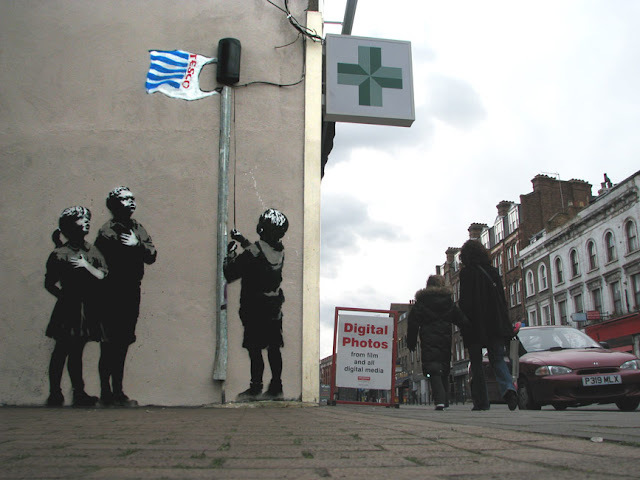 Above: Banksy's Flower Chucker on canvas. 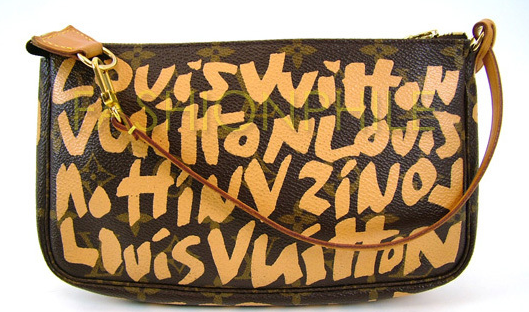 The combination of street graffiti and luxury was a huge hit when Marc Jacobs thought to combine Stephen Sprouse graffiti with Louis Vuitton bags in 2001. 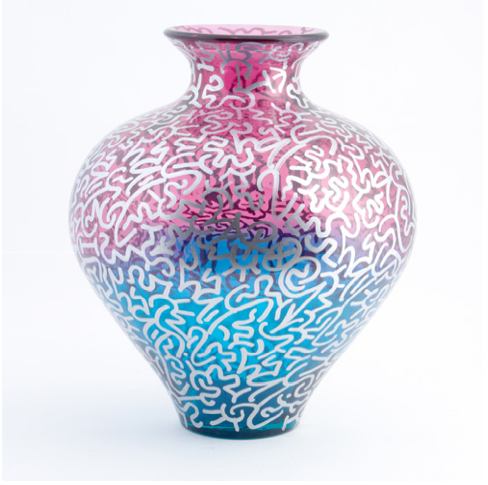 The collection sold like hotcakes and is still in great demand today. 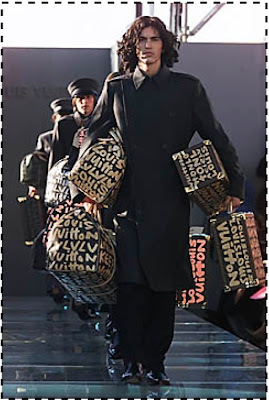 Above: the Stephen Sprouse Collection for Louis Vuitton. 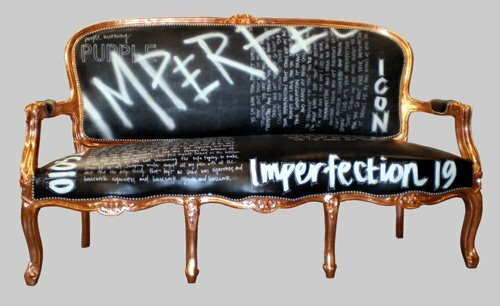 Several designers have taken the urban art form and made into actual furniture. 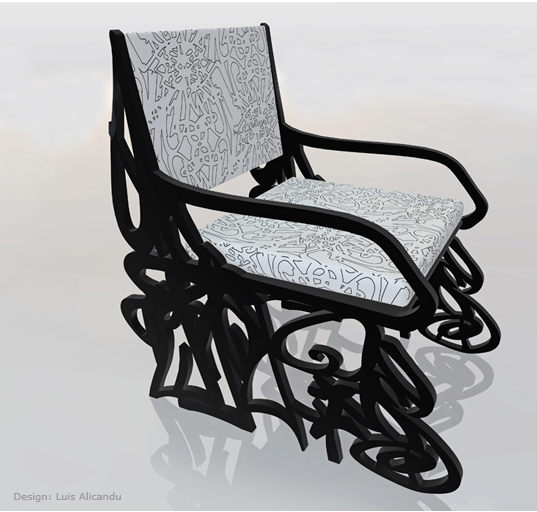 Industrial designer and former tagger, Luis Alicandu from Caracas, Venezuela, now living in London, has designed and created the following pieces. 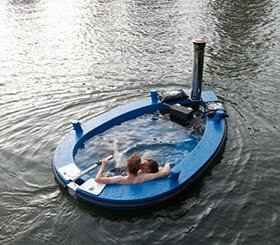 Unfortunately they are not mass produced and are not available for purchase. To learn more about Luis Alicandu a.k.a. CacoUno (his Graffiti tag nickname), or to help him produce these great pieces, go here. 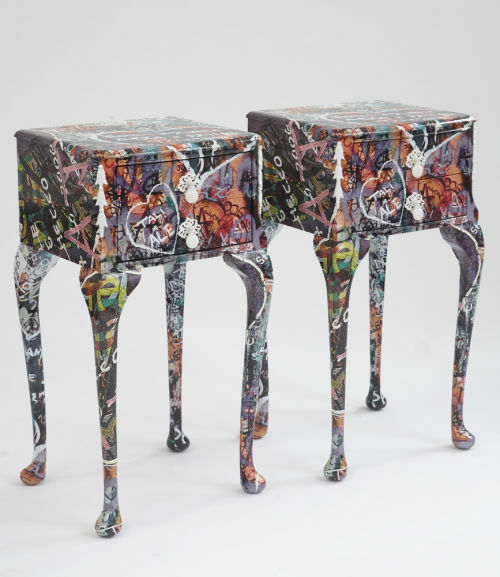 Another furniture line inspired by graffiti is one from the design duo Jimmie and Martin of Jimmie Martin Ltd. By adding graffiti and unusual paint finishes to traditional furniture, they've created a unique niche for the aesthetically trendy. 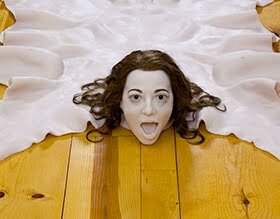 I will be doing a major post on Jimmie Martin in the near future so you can see all of their great work. Verona and Romeo and Juliet have been inspired by Anna James's visits to Juliet's house in Verona, Italy. She is totally captivated by the graffiti covering the walls at the archway entrance, all of it being declarations of love by visiting lovers, of all ages, from all over the world. The colours, and the messages create completely unique images. 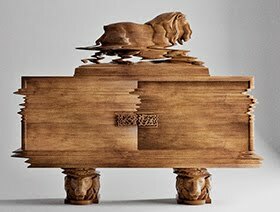 Anna devised a process to replicate the walls on furniture, by taking a series of digital images, which she then transposed onto her carefully prepared period pieces. 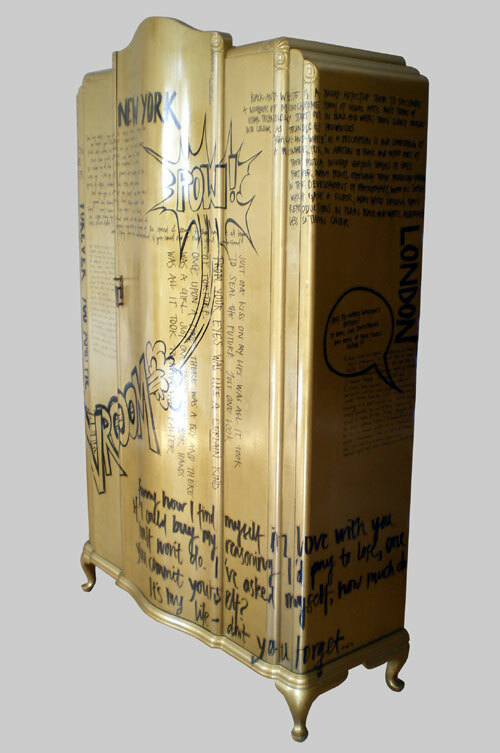 Because messages are constantly being added to the walls, Anna's design for her Verona furniture is unique to a particular moment in time, and gives each piece it's own individual artwork and identity. Is Graffiti the next plaid? Now it's not only left the walls and subway trains to jump to canvases and rebel galleries, but graffiti has found it's way onto everything from apparel to housewares. 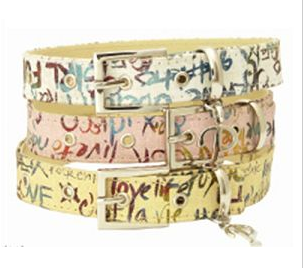 There are graffiti lamps, belts, pillows, bath towels, jewelry, and much, much more. In several instances it's even offered as a pattern choice. Solids, stripes or graffiti? 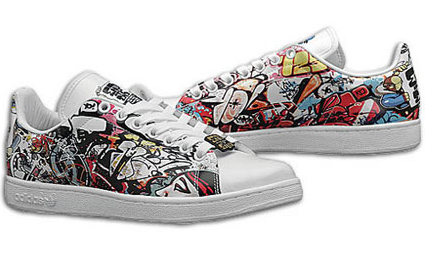 Even athletic shoe company, New Balance, had just released Graffiti kicks in two color variations, joining Converse who already offers a Graffiti hi-top. 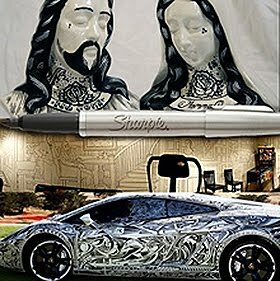 And street artists, Stash and Sket One are designing custom area rugs. Above: limited edition wool rugs by tagger Stash. 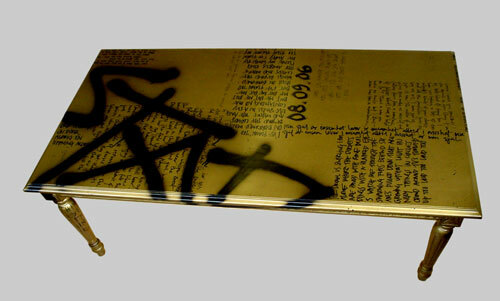 Above: limited edition wool rugs by tagger Sket. 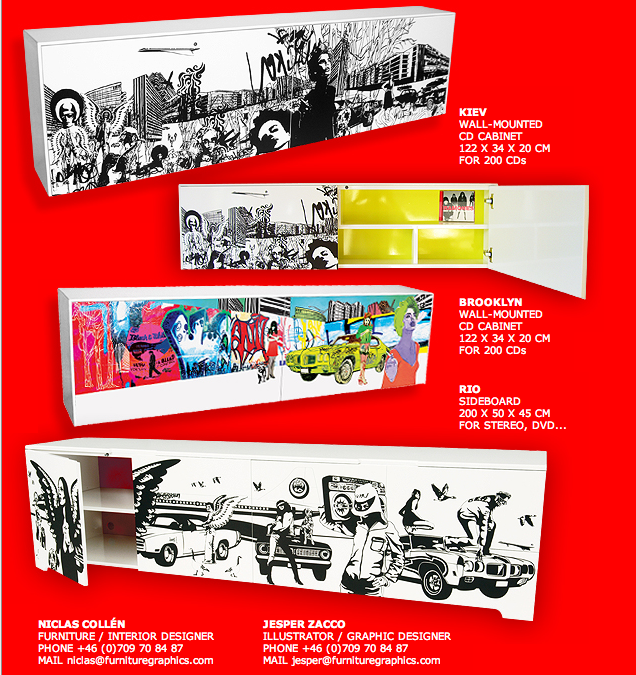 More than one company has produced dinnerware in graffiti styles and now, with Furniture Graphics, you can have a graffiti sideboard to store it in. Above: Cabinets by brothers Niclas Collen and Jesper Zacco of Furniture Graphics. 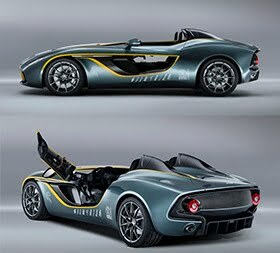 There are so many more items on the market and below are some examples. 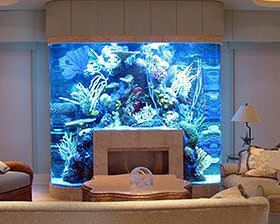 Just click on each image to be taken to a place for more information and a link to purchase. 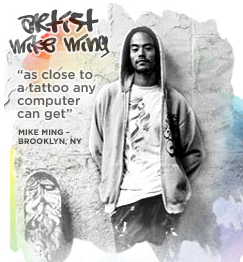 There are graffiti coloring books, how to books, typefaces or fonts, wall stickers, the Graffiti Creator, an online graffiti text generator, laptop skins, even Dell computer collaborated with artist Mike Ming to design 2 limited edition laptops. See the Mike Ming edition Dell laptops here. 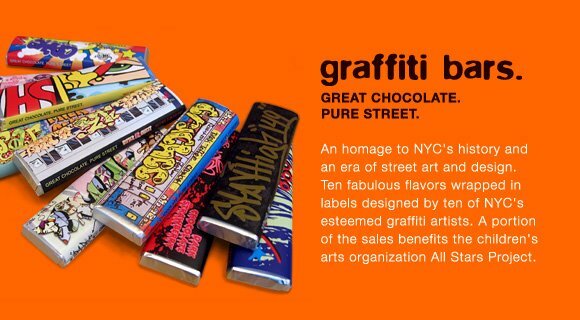 Dell is not the only large company to collaborate with street and graffiti artists to sell products. 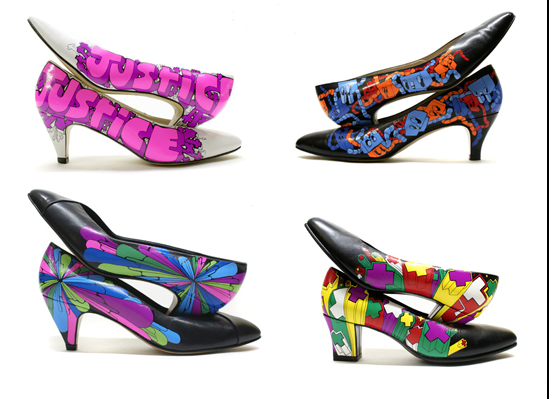 Adidas had a great project named End 2 End where they hired 7 street artists to decorate shoes. See the End 2 End sneaks here. 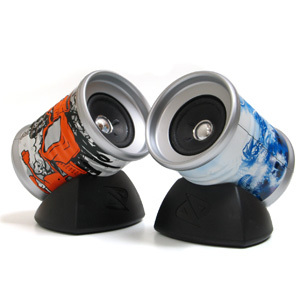 Coming soon from Boost Mobile is a collaboration with artists MINT and SERF (from the East Coast) and MAINFRAME (from the West Coast) to produce the desktop speakers seen below. You can pre-order the speakers here. 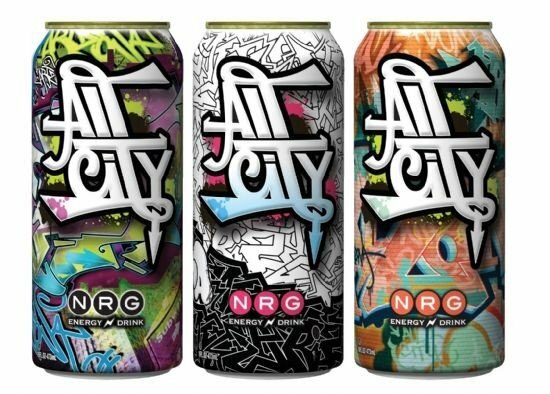 Originating in Brooklyn, AriZona pays tribute to all cities with a colorful energy drink featured in 3 limited edition subway series cans. This bold NON-CARBONATED drink combines pomegranate flavor, green tea and a high energy performance blend. Buy it here. Buy the chocolate bars here. 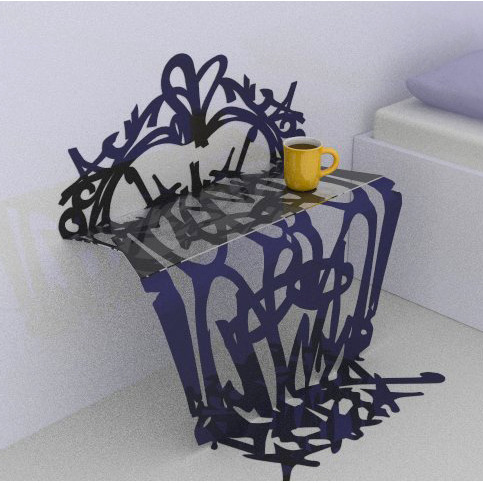 Graffiti Taxonomy is an ongoing project by Evan Roth which presents isolated letters from various graffiti tags, reproduced in similar scales and at close proximity. 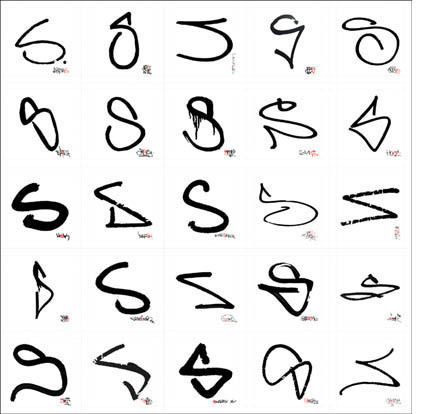 The intent of these studies is to show the diversity of styles as expressed in a single character. 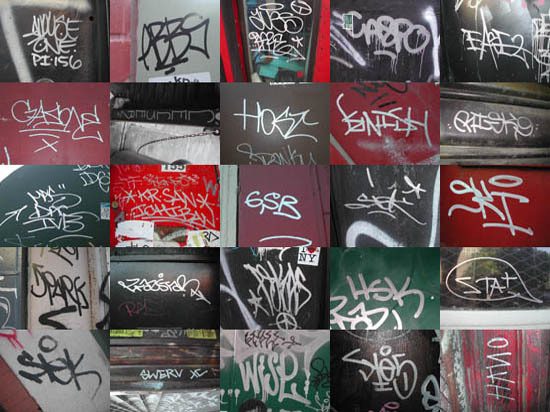 Above: The 'S' is reproduced from photographs of tags taken in the Lower East Side of Manhattan. He is currently seeking any leads for funding or from publications that would allow me to complete each letter of the alphabet from tags found throughout New York City. Please send any leads to Evan at fi5e@ni9e.com. 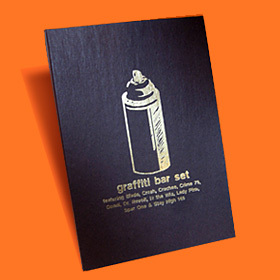 You can buy prints of his Graffiti Taxonomy here. 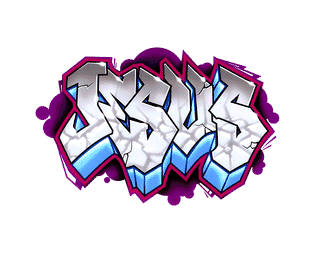 Get the Graffiti Jesus sticker or magnet here. And yes, the trend has even hit the baby demographic. 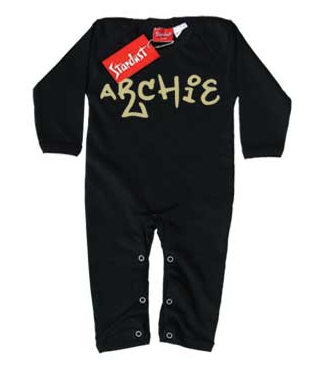 Above: personalized baby sleepsuit from Stardust. 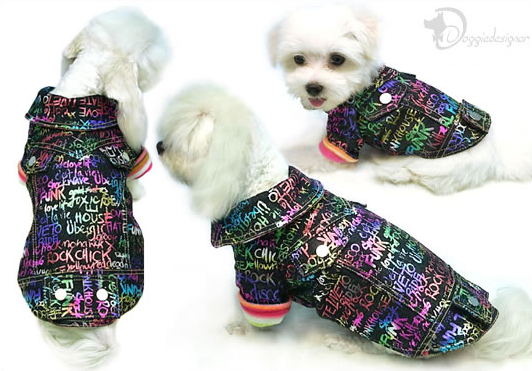 There are graffiti inspired blocks, custom personalized onesies and even custom graffiti hats and clothes for toddlers. 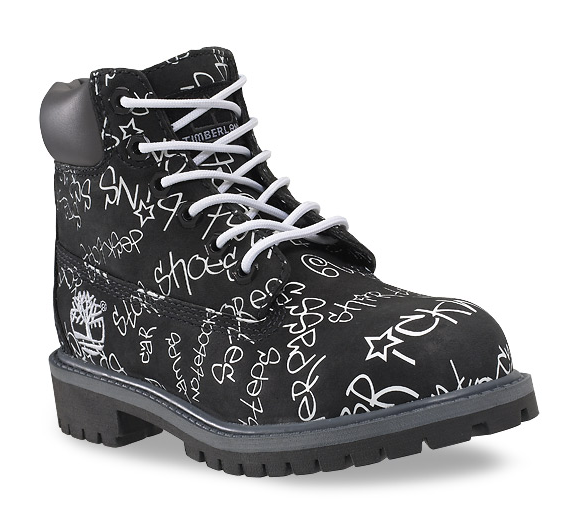 Timberland even makes Nubuck graffiti boots for toddlers! Buy them here (and they are on sale now). 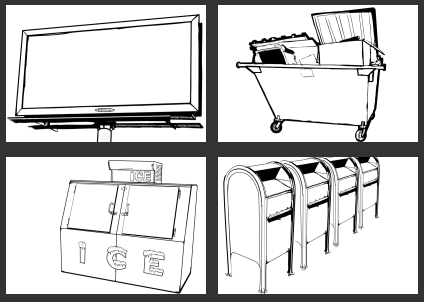 Above: You can download a fun coloring book of unadorned graffiti settings (drawn as line art) of dumpsters, subway trains, mailboxes and more to practice your street art upon from Fake Corporation of America. In America around the late 1960s, graffiti was used as a form of expression by political activists, and also by gangs such as the Savage Skulls, La Familia, and Savage Nomads to mark territory. Towards the end of the 1960s, the signatures (called 'tags')of Philadelphia graffiti writers Top Cat, Cool Earl and Cornbread started to appear. Around 1970-71, the center of graffiti innovation moved to New York City where writers following in the wake of TAKI 183 and Tracy 168 would add their street number to their nickname, "bomb" a train with their work, and let the subway take it—and their fame, if it was impressive, or simply pervasive, enough—"all city". 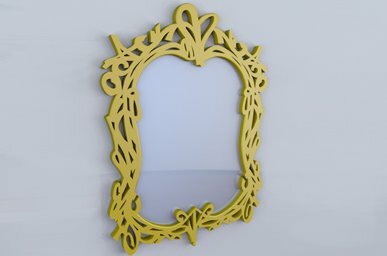 Bubble lettering held sway initially among writers from the Bronx, though the elaborate Brooklyn style Tracy 168 dubbed "wildstyle" would come to define the art. The early trendsetters were joined in the 70s by artists like Dondi, Futura 2000, Daze, Blade, Lee, Zephyr, Rammellzee, Crash, Kel, NOC 167 and Lady Pink. 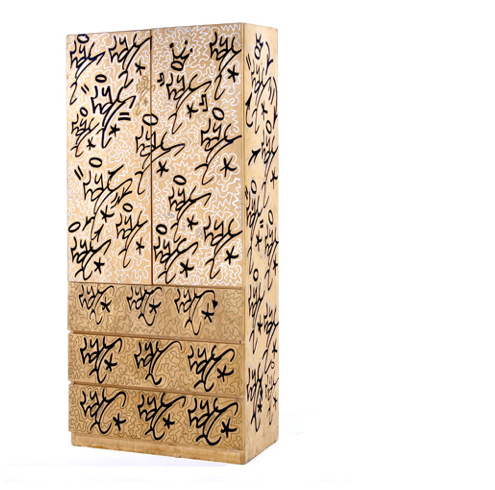 By 1971 tags began to take on their signature calligraphic appearance because, due to the huge number of artists, each graffiti artist needed a way to distinguish themselves. 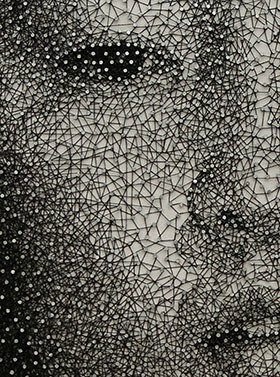 Aside from the growing complexity and creativity, tags also began to grow in size and scale – for example, many artists had begun to increase letter size and line thickness, as well as outlining their tags. This gave birth to the so-called 'masterpiece' or 'piece' in 1972. Super Kool 223 is credited as being the first to do these pieces. (source: Wikipedia). The National Alliance Of Gang Investigator's Associations (how they define gang graffiti). Above: "Cereal Killers' wall by Stet One. 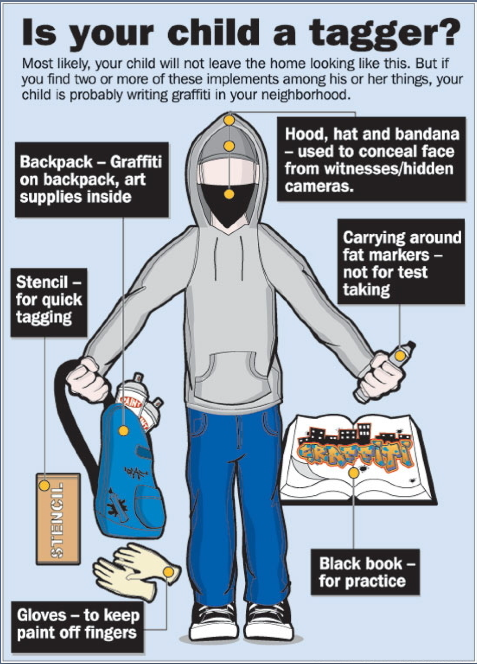 Above: the Santa Ana Police Department uses the above poster to help parents to determine whether or not their child is a tagger. Hilarious. Battle: A contest between crews, judged on hits. 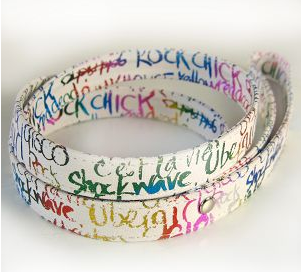 Bomb: Multicolored tag in large bubble letters. Crew: Group of individuals that tag together. Caps: (Fat/skinny) Spray can nozzles used to vary the style and width of paint. Get Up: To put up a large amount of graffiti tags. 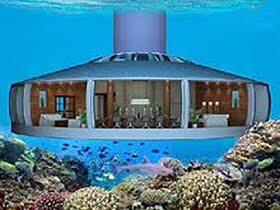 Heavens: Hard to reach high areas such as freeway signs and the tops/upper floors of buildings. Landmarks: A prime location where graffiti won't quickly be erased. Mob: A whole crew doing graffiti on a wall at the same time. 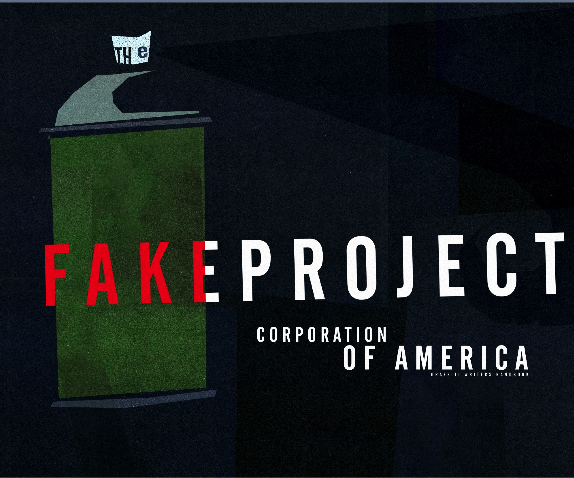 Piece Book: A tagger's sketch book. Rack: To steal from off the store rack. 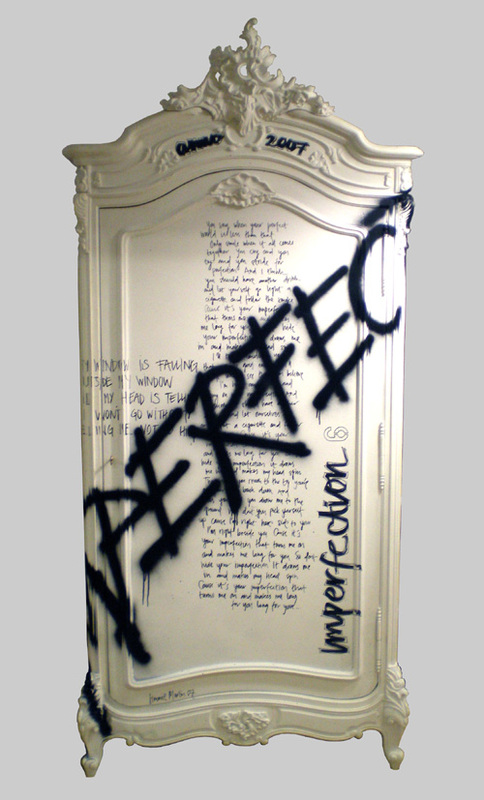 Streak: Short for mean streak, solid paint stick that looks like chalk and is used on dark surfaces. Tag Banging: To use violence to defend a tag. 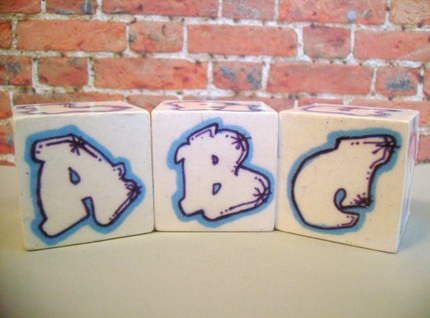 Toy: A new, inexperienced writer. Throw Up: One layer of spray paint filling in bubble letters that are outlined in another color. 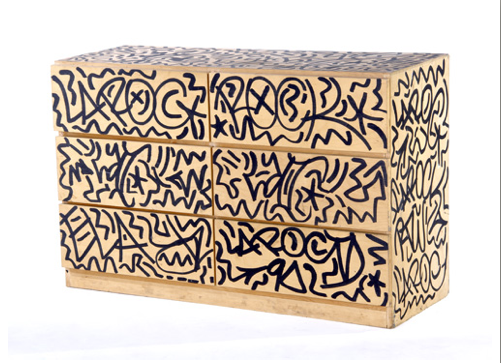 Wild style: A complicated piece constructed with interlocking letters. Wish you could be a tagger but you're too old? Too conservative? 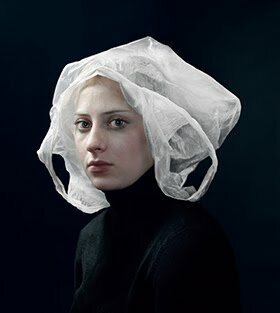 Too safe? Well, here are ways to get the thrill without the criminal record. 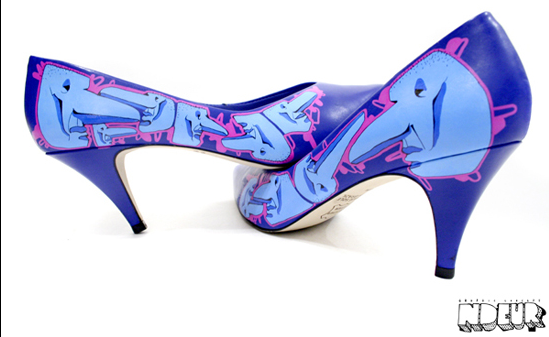 See more graffiti inspired items you can buy on my Tag, you're it! 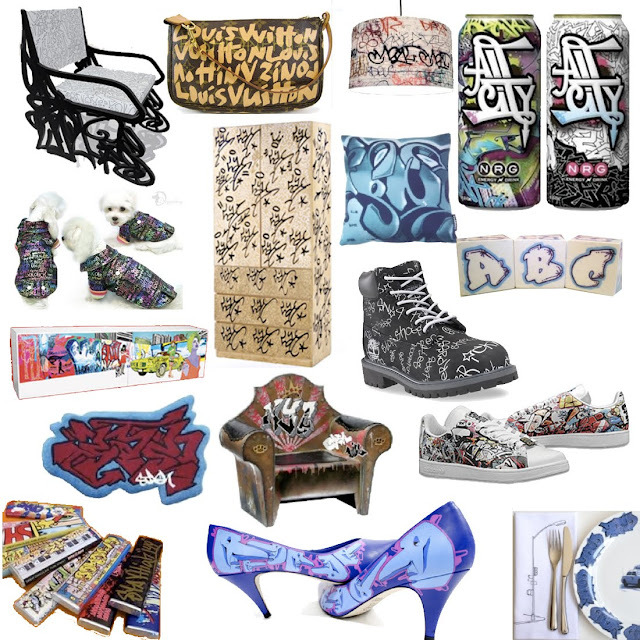 Graffiti inspired items list at ThisNext. Wow, quality post. 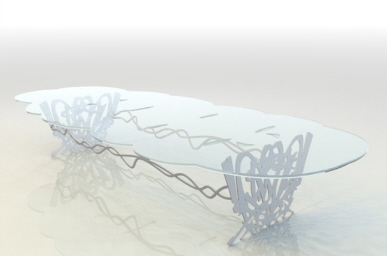 Love some of that furniture. Dang. I guess I didn't know how broadly Graffiti had infiltrated mainstream society. Thanks for that ... nice post. some good stuff in there, and some not so good. interesting post.